Cinti/I74W to St.Leon Exit,RT-SR1,LT-SR46,4.25mi home-LT.Sign on. Convenient country living located mins from I-74 at St.Leon or Sunman Exits! 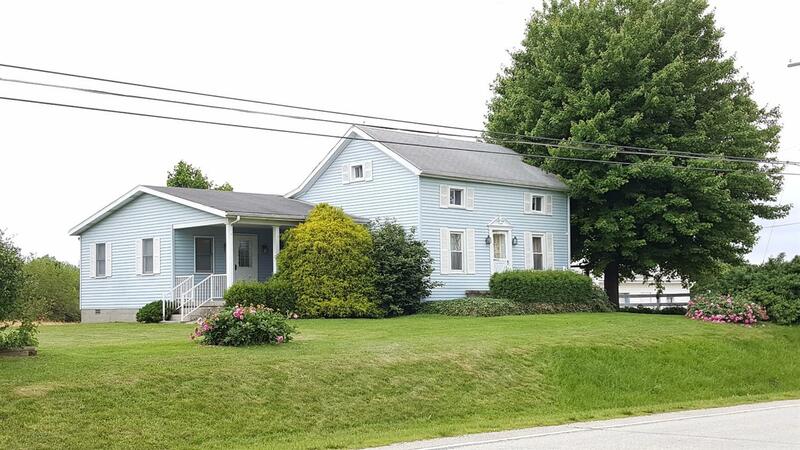 Well-maintained farmhouse, all appls included plus freezer,washer & dryer! W&D hookups in bsmt & 1st flr closet. Replacement windows,vinyl siding,more! Located on 5 acres,Garage/barn:20x30 w/lean-to:17x30,outbldg:10x22. Immediate occupancy. R/E Taxes reflect NO exemptions. NOTE: This property was sold on 9/7/2017 and is no longer available. The details listed below are believed accurate to the date of the sale and are subject to change. Settled in the early 1800's by Swiss, German, and French settlers, St. Leon was first named St. Joe's for the site of the first Catholic Church in the area. When the Post Office later opened the paperwork was mistakenly changed to St. Leon. Today St. Joseph is still the only church in town. Wide open spaces mark the town of St. Leon, with only 600 residents spread over the 7 square miles of the town's boundaries. While there's plenty of room for rural pursuits, don't let the slow pace fool you-there's a lot to do here. St. Leon is a well-known repository for trilobites; fossil hunters are frequently found scouring the shale deposits along the area's county roads. Politics is a great source of debate in this town; St. Leon is well known for its election pole raising, an event that dates back to the 1870's. Each presidential election year Democrats go in the nearby woods with a crosscut saw to cut a tall straight hickory tree, which they trim except for a few branches at the top. Brackets are attached to fasten an American flag and the Democrat emblem, a rooster. A parade and speeches accompany the ceremony and the pole remains up until after the election. Housing in the area includes older ranch homes, country farm homes to some new construction. Located along St. Rt. 1 off Interstate 74, 30 miles from Cincinnati. Dearborn County Hospital in Lawrenceburg and Margaret Mary Community Hospital in Batesville serves the area's medical needs. The nearest Community Mental Health Facility is in downtown Lawrenceburg. Small shops dot St. Leon, with most necessities available in nearby communities. Outdoor pursuits like hunting and fishing provide opportunities for recreation. Urban farmers have discovered the pleasures of living off the land, with spectacular gardens and small working farms dotting the landscape. Brookville Lake is the center of water sports, offering water recreation options including fishing, skiing, boating, swimming, canoeing, and more.